Metal or steel roofing systems are a durable, long lasting roofing material. They can withstand the harshest of weather conditions. From hurricanes in the southern states to the cold snow and ice storms we see around Barrie and the surrounding area. You can rest assured that your metal roof will stand the test of time. When properly installed, metal roofing requires very little ongoing maintenance. 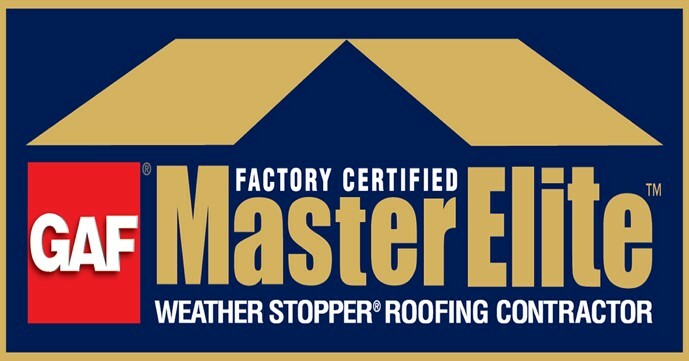 It also boasts a longer life expectancy than other roofing systems such as asphalt shingles. Metal roofing is also 100% recyclable, making it the most environmentally friendly roofing material available. Steel or aluminum roofs are resistant to high winds, ultraviolet rays and even earthquakes. Their all metal construction makes them fire resistant. 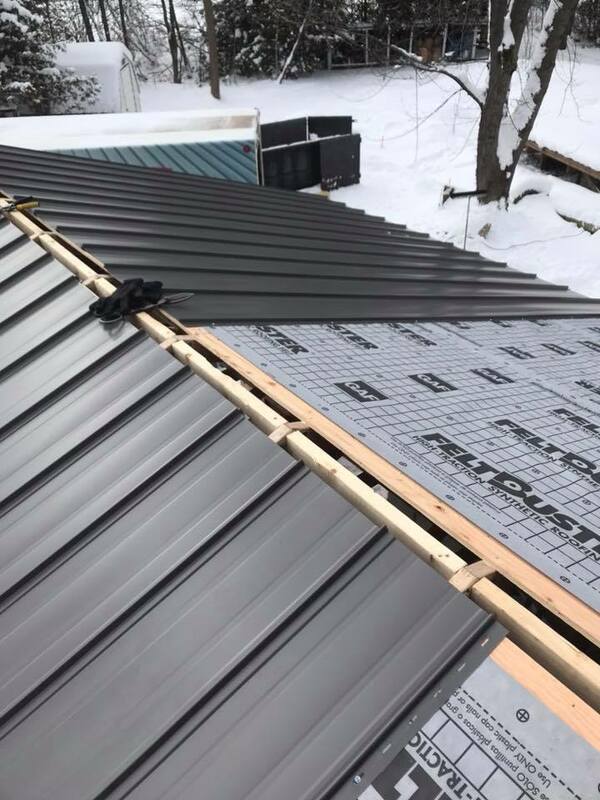 Installing a metal roof will increase the resale value of your home and may reduce the cost of your house insurance (Check with your insurance agent). Metal roofing comes in a variety of colours and styles making it easy for you to find the perfect roof for your home. The low maintenance required and longer life expectancy of a metal roof come at a cost. Compared to a traditional, mid-range asphalt shingle, a typical metal roof will run you two to three times more money to install. Be cautious of low quality, cheap metal roofs. 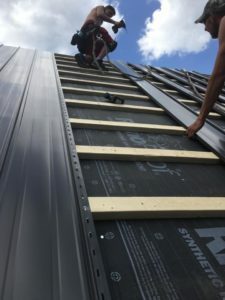 These systems will save you money up front but with exposed fasteners, low grade paint and a reliance on strapping or battens, they could cost you more down the road. They may rust over time. Fasteners will move over time and after 10-15 year may need tightened or replaced. You also want to make sure your metal roof material comes from a country with strict quality standards. Metal that comes from some overseas countries may be cheaper but will have a lower quality ratio of zinc to carbon. A couple misconceptions about metal roofs are that they are louder during a rainstorm and that they attract lightning. Metal roofs do not attract lightning anymore than any other type of roof. A professionally installed metal roof with a good quality substrate will not produce more noise than an asphalt or cedar shake roof. How much does a Metal Roof cost compared to an Asphalt Roof? Roofing accessories such as vents, skylights, chimneys, etc. Are there leaks in your roof. A typical, mid range asphalt shingle will run you approximately $2.80 - $4.00 per square foot. This price will vary depending on the type of asphalt shingle you choose. A low-end metal roof will range from approximately $4.50 - $6.50 per square foot installed. 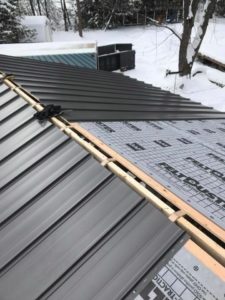 Higher-end metal roofs such as steel and aluminum can range from $8.50 - $12.00 per square foot installed and depending on the type of metal roof chosen, upwards of $20.00 per square foot installed. 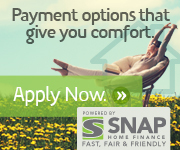 Prices will vary based on the experience of your roofing contractor as well. An experienced roofing company may charge more but are able to complete the job quicker and to a higher standard than a new roofing company. 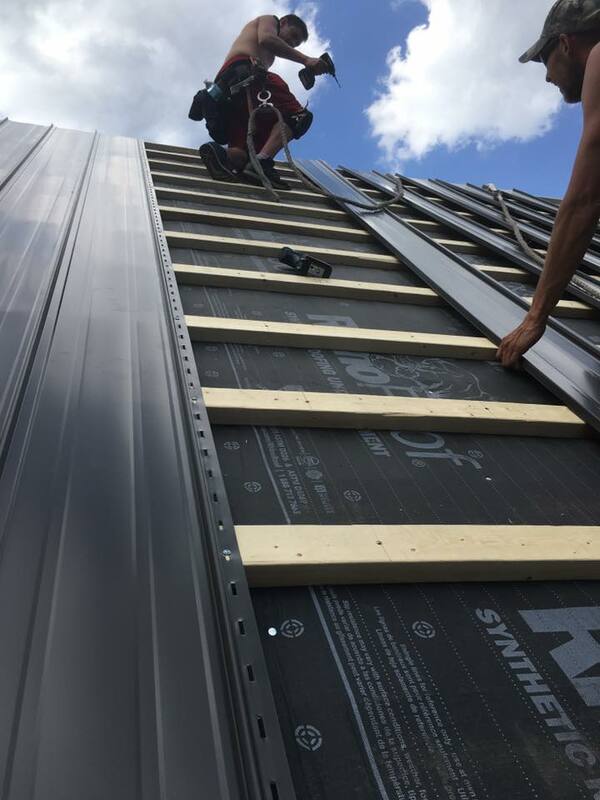 Brentwood Roofing is an experienced roofing company that has been serving Newmarket, Aurora and all of southern Ontario for almost 40 years. Let our experience and proven track record speak for itself. And our 5 year workmanship warranty comes standard on everything we do. Let Brentwood Roofing worry about your roof so you don’t have to.